As hurricane Sandy batters the New York metropolitan area, cruise lines are still scrambling to provide vacation experiences and maintain schedules. Below are the updates provided by the cruise lines. Given the current information regarding the path and speed of Hurricane Sandy, and as long as the Port of New York re-opens, we expect embarkation for Norwegian Gem’s next cruise to take place on Wednesday, October 31 beginning at noon and the ship will depart at 4 pm. Guests should continue to check ncl.com for the latest information or call 800-327-7030 if they need assistance. As soon as the Coast Guard re-opens the Port of New York, Norwegian Gem will proceed to the pier which may be Tuesday, October 30, in the afternoon. At that time, we would give guests the option of disembarking the ship or staying onboard overnight, allowing them the opportunity to make the appropriate travel arrangements. 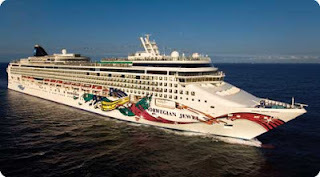 Norwegian Jewel will arrive as scheduled in Port Canaveral, Florida tomorrow, Tuesday, October 30. Norwegian Dawn is overnighting in Halifax, Nova Scotia and will depart at 7 am tomorrow. The ship is scheduled to call in Boston on Wednesday, October 31. Guests on board these vessels will be kept up to date by the ship’s Captain. We appreciate our guests’ understanding and patience. Royal Caribbean International continues to closely monitor the path and progress of Hurricane Sandy to ensure guests enjoy safe and comfortable cruises, and to make certain our ships steer clear of the storm. The safety of our guests and crew is always our foremost concern. Brilliance of the Seas cancelled its call to Bar Harbor, Maine, for Tuesday, October 30. Instead, the ship called to St. John, New Brunswick, today, as scheduled, and will remain in port until Tuesday. This will provide the ship with the most shelter from the weather and ensure a safe and comfortable experience for all guests and crew onboard. Enchantment of the Seas will be unable to call on Kings Wharf, Bermuda, as originally scheduled. Instead, the ship sailed out to sea in an effort to try to find the calmest seas possible. Given Hurricane Sandy’s current location and projected path, Jewel of the Seas did not depart Boston, Massachusetts, yesterday, as scheduled, but will remain docked in port until Tuesday, October 30. Due to the delayed departure from Boston, Jewel of the Seas will sail a revised itinerary. Passengers onboard Caribbean Princess’ voyage B237 are currently in Boston during Day 2 of a 4-day cruise. Passengers have been advised that the ship plans to sail for New York tomorrow (Tuesday). The sea conditions will require the vessel to operate at significantly reduced speeds and will impact their arrival into New York. We currently expect to be delayed by at least one day and arriving no earlier than Thursday morning. As this unprecedented weather condition is constantly changing, we will continue to keep our passengers onboard updated on the situation. Due to the unprecedented circumstances, we understand that some passengers will wish to disembark in Boston and have provided them information how to disembark Tuesday. We are currently rebooking air travel for those passengers who purchased air through Princess, and are offering complimentary phone and internet services for those passengers who need to make changes to their independent travel plans. As a gesture of goodwill, in recognition of the extreme circumstances, we are offering compensation to all passengers onboard in the form of a Future Cruise Credit. Once we are underway and the full impact on our voyage is known, we will communicate details to the impacted passengers while onboard. We look forward to welcoming passengers onboard for Caribbean Princess’ voyage B238 originally scheduled to embark on Wednesday, October 31. Due to the extreme weather conditions of Hurricane Sandy, we have advised our passengers on Caribbean Princess’ voyage B238 that we expect to embark passenger later than originally planned. We sincerely apologize for the inconvenience; however the current voyage of Caribbean Princess is expected to arrive into New York at least one day late, impacting the embarkation for the following voyage. We tentatively expect our embarkation to be moved from Wednesday, October 31 to Thursday, November 1. Passengers will receive a per diem for any cruise days missed due to a late embarkation. As this unprecedented weather situation continues to change, we will keep passengers updated as to any new information. Those passengers who have Princess Air and/or Princess transfers will be contacted regarding their specific travel plans. We apologize for the inconvenience and look forward to welcoming our passengers onboard. Passengers joined Emerald Princess yesterday in Quebec to begin their 12-day cruise ending in Ft. Lauderdale on November 7. Due to the presence of Hurricane Sandy and the impact it will have on the New England area, the port calls to Bar Harbor, Boston and Newport have been cancelled. Port calls to Port Saguenay and Corner Brook have been added. We will continue to provide updates on Princess.com as more information becomes available. Due to the anticipated arrival of Hurricane Sandy, the Port of New York will be closed to shipping traffic as of 6 PM this evening. At this point it is unknown as to when it will reopen. Royal Caribbean's Enchantment of the Sea sailed from Baltimore on 10/26 on what was to be a 6-Day Bermuda Cruise. 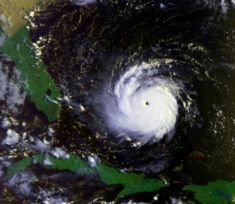 Due to the approaching Hurricane Sandy, Royal Caribbean announced, at the start of the cruise, that the Enchantment of the Seas would not sail to Bermuda but would head out to sea to avoid the storm. The Enchantment of the Seas, with it's full complement of passengers, proceeded down the Chesapeake back and was hovering around the mouth of the Chesapeake Bay - only to return to the Chesapeake Bay and is now moored/anchored just north of Cape Charles, Virginia. It is expected that the ship will never really leave the Chesapeake Bay area before returning to Baltimore on 11/1 for its next cruise. Sunday Update on Hurricane Sandy - Northeast Updates Only. 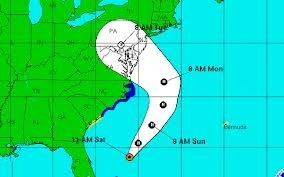 We continue monitoring the forecasted path of Hurricane Sandy and keeping in close contact with port officials. As always the safety of our guests and crew is our number one concern and our ships will maintain a safe distance from the storm at all times. The port is expected to close at 6:00PM on Sunday. In an effort to continue with the cruise and keep safely away from the storm, the cruise will now depart on Sunday, October 28. Check-in is scheduled from 2:00PM to 4:00PM, and sailing is set for 5:00 PM from Pier 90. Due to the short notice, we were unable to reschedule the delivery of our supplies (food, beverages, etc.) that was planned for Monday. Unfortunately, we will need to change our itinerary so that we can receive our provisions at the first port. Guests who sail will be treated to complimentary gratuities for the extra day and will be reimbursed for any additional parking expenses at the port. If you are unable to sail, please contact us at 1800 CARNIVAL. CARNIVAL GLORY – 10/28/12 DEPARTURE HAS BEEN CANCELED Due to the storm, high winds and tidal flooding are expected in the Norfolk area. The Norfolk cruise terminal is positioned behind a major flood gate in the city which will likely close during the day tomorrow. When this happens, there will be no access to the cruise terminal. We are sorry to say that we have no alternative but to cancel the 10/28 cruise. Refunds will be processed to the original form of payment within the next 2 weeks. We know how much our guests were looking forward to this getaway and regret the disappointment this has caused. We look forward to welcoming you on board on another Fun Ship in the near future. The US Coast Guard has just made us aware that we will not be able to depart from the Chesapeake Bay. At this time, it is uncertain when this restriction will be lifted. We respect the Coast Guard’s decision and since we do not know when we will be cleared to sail, we will not be able to operate this cruise. Guests will be provided with a full refund (within two weeks to the form of payment) and a 25% future cruise discount. Parking expenses will be refunded as they leave the parking facility. Should guests need a hotel room for this evening, please have them contact a Guest Logistics team member in the terminal. We will also cover $30 per person for dinner this evening. We are sorry for the disappointment this has caused. There are no changes expected for any other sailings departing this weekend. In the event we need to make a deviation to a future itinerary, we will update our guests. Norwegian Jewel will embark guests in New York and depart as scheduled today. 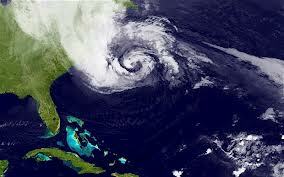 The US Coast Guard has advised that it will close the Port of New York as of 6 pm today, Sunday, October 28. Therefore, Norwegian Gem’s arrival in New York on Monday, October 29 will be delayed and the ship will remain at sea. The Coast Guard has not yet determined when it will re-open the Port of New York. Therefore, guests scheduled to sail on Norwegian Gem’s October 29 sailing are asked to continue to check ncl.com for the latest updates and information. We expect an update on the ship’s arrival and departure times on Sunday evening. Norwegian Dawn will cancel its call to Portland, Maine on Tuesday, October 30 and instead stop in Halifax, Nova Scotia on Monday, October 29 from 10 am to 8 pm. We appreciate our guests’ understanding. Information about the hurricane "Sandy"
Current weather forecasts, predict the arrival on Sunday, Monday and Tuesday of the tropical cyclone Sandy in New York. In addition to strong winds and massive rainfall for New York, a storm surge is predicted. For this reason, the authorities have arranged a closure of the port from Sunday, 28.10.2012, 18.00 o’clock. For safety reason, all vessels are leaving the port. Therefore AIDAluna is departing on Sunday afternoon from New York. How long the port will remain closed from today's perspective cannot be predicted. Most guests, flying back from New York from the prior cruise, to a large extent, have already reached their home. A few travelers flying home on Sunday night were on canceled flights. Affected Guests were offered and encouraged to sail to Miami on board Aida Luna and from there begin their journey home. For guests who did not arrive in New York in time for the AIDAluna’s early departure, are now alternatively to fly into Miami to meet the AidaLuna. The arrival of the ship in Miami is scheduled for Wednesday afternoon. All guests who have booked their trip through AIDA, and because of the port closure could not go to New York to board, will be contacted directly by AIDA Cruises and informed of their alternative flight. AIDA Cruises has arranged two full charter flights for Monday 30 October 2012, to transport travelers to Miami. More individual reservations and full charter flights are currently being booked for Monday and Tuesday to get to Florida. Once the airlines, have confirmed the reservations, we will inform our guests individually. Many guests have already been informed. Please understand that it takes some time to inform all guests about their individual flight arrangements. In Miami, guests can expect a shuttle to your hotel. There guests will be accommodated until the arrival of AIDAluna in Miami. AIDA Cruises contacts will be there and look after the guests. In all likelihood, all scheduled ports of travel will adhere to published times. Since the Port of Baltimore was closed due to the effects of Hurricane Sandy, Baltimore will be skipped. Individually arriving guests that have to date not yet checked on AIDAluna are asked to contact the AIDA Cruises to determine your options..
No changes have been announced for Queen Mary 2 Sailing today (transatlantic) or Royal Caribbean's Explorer of the Seas (Bermuda). Carnival Cruise Line's Carnival Glory left Norfolk (without passengers) and is currently sailing (in a zig-zag pattern), sailing off of the Outterbanks, North Carolina along the coast. She does not appear to be trying to out run the storm but appears to be cruising in a rectangular pattern. As of 6:30 PM, It appears that the Carnival Pride (without passengers) is departing Baltimore and is riding out the storm in the Chesapeake.She is currently Anchored off of Shady Side, Maryland. AidaCruises - Aida Luna departed New York today at 6:00 PM - a day early and is skipping a planned stop in Baltimore - instead she is heading directly to Miami. Report indicate that the Port of New York will close tomorrow (Sunday) at 6 PM to Marine Traffic. The closure is due to Hurricane Sandy which is expected to hit the Tri-State Area Sunday through Wednesday. The date the port is to reopen is TBD at this time. We look forward to welcoming our passengers onboard Saturday. As we previously communicated, we made the decision to cancel our call to Bermuda to avoid the worst of the storm with predicted strong winds and high swells. While we make every effort to sail our itineraries as originally planned, the safety and security of our passengers and crew is our highest priority and this decision, while disappointing, is necessary. We currently expect that we will enjoy a call to Boston, Massachusetts during this cruise. The exact timing of our call will be confirmed once passengers are onboard and is dependent upon weather conditions. The Shore Excursions team will have information on tour descriptions, times, and prices available at the Shore Excursions Desk once the timing of the call is determined. For those who purchased Princess Vacation Protection and would like to review their options, please contact your travel agent or Princess for additional information. We have limited availability on other ships and itineraries. For those passengers who are driving to the pier, we have been advised that the parking area at the Brooklyn Cruise Terminal is prone to flooding. For our passengers who were planning to drive and park at the pier, it is strongly recommended that instead of parking at the pier you make alternative arrangements. Due to the presence of Hurricane Sandy and the impact it will have on the New England area, the port calls to Bar Harbor, Boston and Newport R have been cancelled. Port calls to Port Saguenay and Corner Brook have been added. Due to high winds caused by Hurricane Sandy, Monarch of the Seas' departure from Port Canaveral, Florida, continues to be delayed. Unfortunately, due to the delayed departure, and the time and speed needed, the ship will be unable to call on Freeport, Bahamas. Also, because of our need to prepare CocoCay, Bahamas, for the weather impact, Monarch of the Seas will not call on CocoCay. Once the ship is able to depart Port Canaveral, it will head out to calm waters. Given Hurricane Sandy's current location and projected path, it is likely that Jewel of the Seas' itinerary will be impacted. We will continue to monitor the storm and provide guests sailing on Jewel of the Seas this Sunday, October 28, with additional information on their itinerary once the board the ship tomorrow. We encourage guests sailing on Explorer of the Seas on Sunday, October 28, continue to monitor this website for any additional updates. Norwegian Jewel will embark guests in New York as scheduled tomorrow, Sunday, October 28. 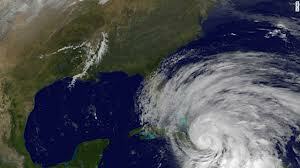 The US Coast Guard has advised that it will close the Port of New York as of 6 pm Sunday, October 28. Therefore, Norwegian Gem’s arrival in New York on Monday, October 29 will be delayed and the ship will remain at sea. The Coast Guard has not yet determined when it will re-open the Port of New York. Therefore, guests scheduled to sail on Norwegian Gem’s October 29 sailing are asked to continue to check ncl.com for the latest updates and information. We expect an update on the ship’s arrival and departure times on Sunday evening. Guests on board impacted Norwegian ships will be kept up to date by the ship’s Captain. The port is expected to be closed on Monday. In an effort to continue with the cruise and keep safely away from the storm, the cruise will now depart on Sunday, October 28. Check-in is scheduled from 2:00PM to 5:00PM, and sailing is set for 6:00 PM from Pier 90. CARNIVAL PRIDE – 10/28/12 DEPARTURE The current cruise will be returning this evening at 8:00PM and debarking guests this evening. The 10/28 cruise will sail tomorrow as scheduled. 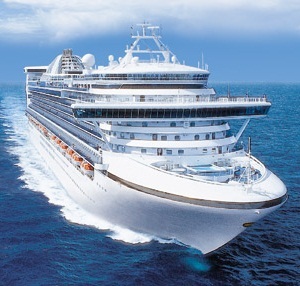 Princess Cruises Announces Itinerary Changes as a Result of Hurricane Sandy. We look forward to welcoming our passengers onboard tomorrow. We continue to monitor Hurricane Sandy as there are different forecasts on where it will make landfall. As we previously communicated, we made the decision to cancel our call to Bermuda to avoid the worst of the storm with predicted strong winds and high swells. While we make every effort to sail our itineraries as originally planned, the safety and security of our passengers and crew is our highest priority and this decision, while disappointing, is necessary. We are currently reviewing all options for a possible alternative port to visit during this four-day cruise. Once more information regarding the weather and berth availability is determined, we will let passengers know. Please be aware that as this is a very fluid situation, we may not have the final itinerary until later Saturday or Sunday. Passengers joined Emerald Princess today in Quebec to begin their 12-day cruise ending in Ft. Lauderdale on November 7. We continue to monitor Hurricane Sandy as there are different forecasts on where it will make landfall. While we make every effort to sail our itineraries as originally planned, the safety and security of our passengers and crew is our highest priority. We are currently reviewing all options allowing us to adjust our itinerary by visiting alternate ports to avoid the worst of the weather. Once more information regarding the weather and berth availability is determined, we will let passengers know. Please be aware that as this is a very fluid situation, we may not have the final itinerary until later Saturday or Sunday. Enchantment of the Seas will not be able to call on Kings Wharf, Bermuda, as originally scheduled. Instead, the ship will sail out to sea in an effort to try to find the calmest seas possible. 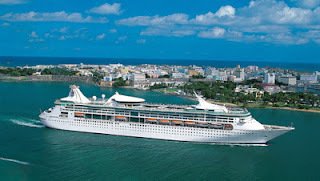 The Enchantment of the Seas was scheduled for a 6 Day cruise to Kings Wharf Bermuda. It now appears that the ship is headed to Norfolk to sit out the storm. 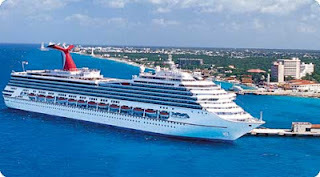 Hurricane Sandy has resulted in further changes for Carnival Cruises Carnival Glory. CARNIVAL GLORY - 10/28/12 DEPARTURE:The Carnival Glory is returning early from its current cruise on Saturday. 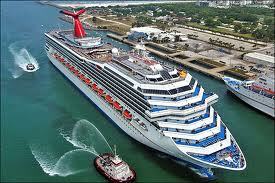 Embarkation for the Carnival Glory is still scheduled for Sunday, October 28 in Norfolk. Due to Hurricane Sandy, Norwegian Cruise Line's Norwegian Jewel will arrive in Norfolk Today. The call in Norfolk, replaces a planned call in Nassau on Thursday. Hurricane Sandy is causing cruise lines to move their passenger out of the track of the approaching storm. The Storm is currently located off the coast of Southern Florida and is expected to move up the coast and potentially making landfall near New Jersey, Sunday Thru Tuesday, of next week. New York cruise ships already impacted by the storm includes the Norwegian Jewel, which was supposed to call in Nassau today is steaming toward Norfolk, Virginia and expected to arrive in New York Sunday ahead of the storm. Norwegian Gem will cancel its call in Samana, Dominican Republic, on Friday, and will proceed to New York scheduled to arrive on Monday. The Norwegian Gem, which is on a 9-Day Eastern Caribbean cruise, will be heading to New York behind the storm. The New York-based Carnival Miracle will miss scheduled calls at St. Thomas and Grand Turk, remaining at sea and arriving in back in the Big Apple on Monday. Out of Baltimore, the Carnival Pride is hugging the Florida Coastline heading to Baltimore skipping a scheduled stop in Port Canaveral. The Carnival Glory, out of Norfolk, skipped a call in Nassau today and instead remained at sea. The Carnival Glory is expected to arrive back in Norfolk on Sunday. No schedule modifications have been announced for this weekend's sailing, but changes are expected. Royal Caribbean's 3 Day Sale Thru October 17th.